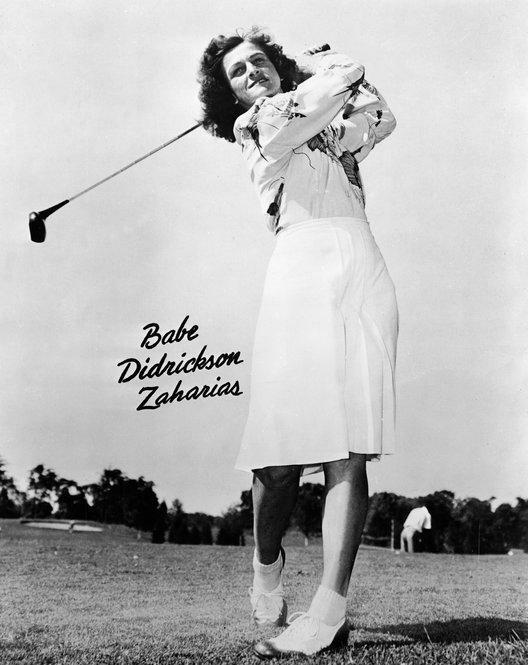 Golf, track, basketball ... Babe Didrikson Zaharias could do it all. 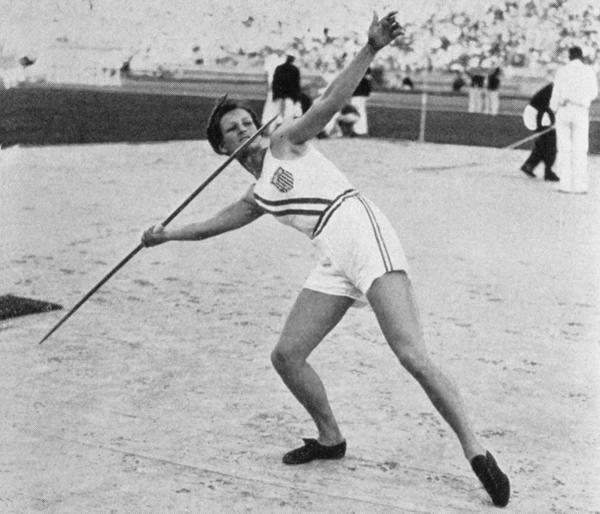 Mildred "Babe" Didrikson, one of the most versatile athletes of all time, first received attention as a star in basketball and track and field. Here, Didrikson (second from right) pulls ahead of teammate Evelyne Hall (far right) to win the women's 80-meter hurdles at the 1932 Summer Olympics in Los Angeles. 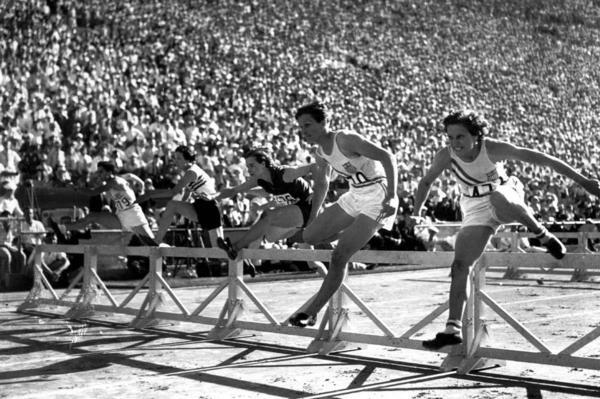 Didrikson set an Olympic and world record in 1932 with her 11.7-second time in the 80-meter hurdles. Her national record in the same event, set in 1931, stood for 18 years. A javelin throw of 43.69 meters won Didrikson a second gold medal at the 1932 Summer Games. She and teammate Jean Shiley tied for gold in the high jump, but her medal was demoted to silver after judges questioned her form. Boosted to stardom, Didrikson became a darling of the press and considered her options for turning pro. 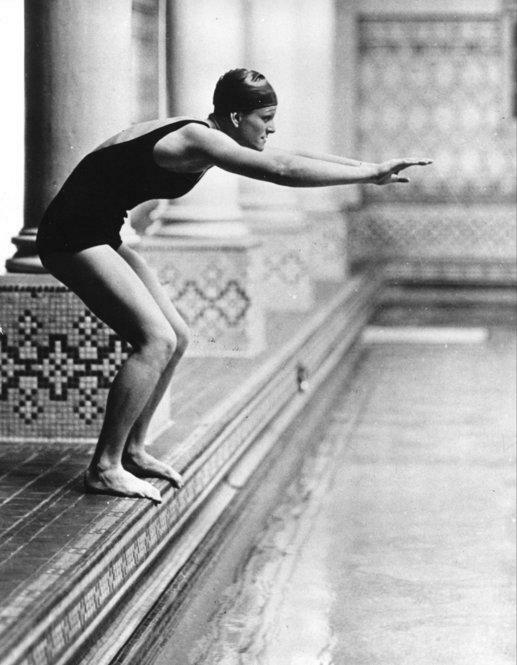 Here, she prepares to dive into a pool in White Sulphur Springs, W.Va., in December 1932. In January 1933, Didrikson played exhibition basketball and a series of billiard matches. She even laced up boxing gloves at Art McGovern's New York gym, where she trained. 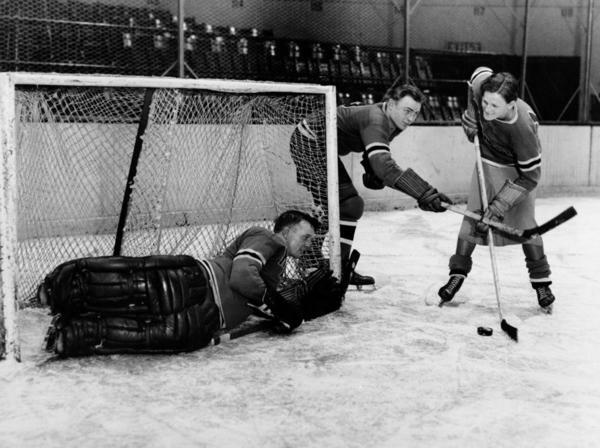 Andy Aitkenhead (left) and Murray Murdock of the New York Rangers pose with Didrikson in Madison Square Garden in January 1933. Her vaudeville act — which showcased her athletic prowess — opened in Chicago a few weeks later. 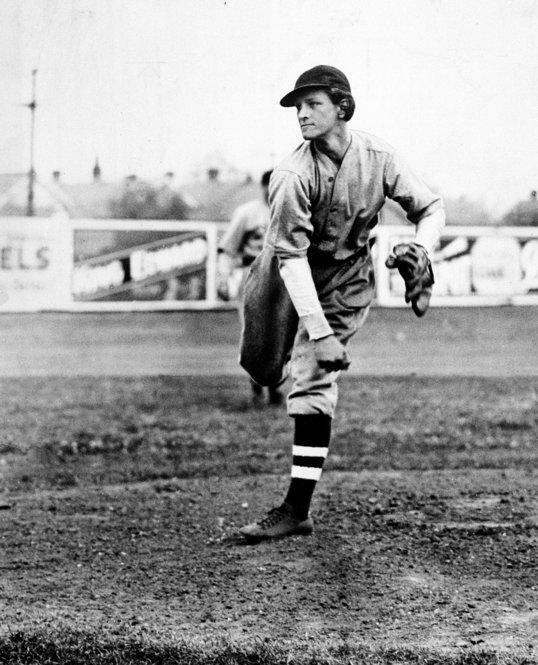 Didrikson takes the pitching mound in a baseball game in March 1934. She played on various baseball and softball teams throughout her career. During the mid-1930s, Didrikson's interests shifted to golf. Though she missed the cut in the 1938 L.A. Open, she found her future husband in George Zaharias, her partner for the tournament. They were married on Dec. 23, 1938, and she became Babe Didrikson Zaharias. Zaharias returned to the L.A. Open in January 1945, becoming the first woman in history to make the cut in a regular PGA tournament. She shot a 76 on the first day of competition. When asked the secret of her golfing success, she loved to reply, "I just loosen my girdle and take a whack at it." She is pictured here in a 1947 promotional photo. 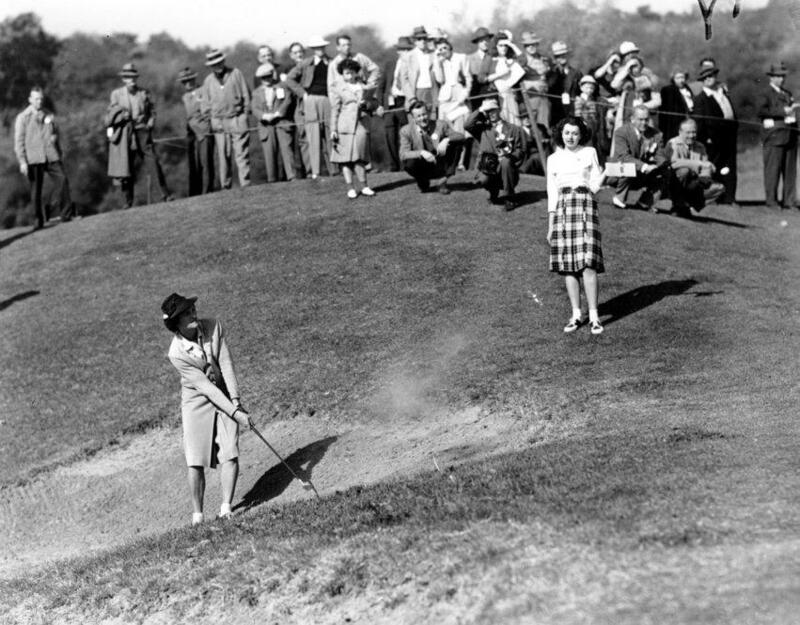 Zaharias urges the ball into the cup on the 18th green at the Women's All-American Golf Tournament on Aug. 4, 1950. Diagnosed with colon cancer in 1953, Zaharias had surgery that April. 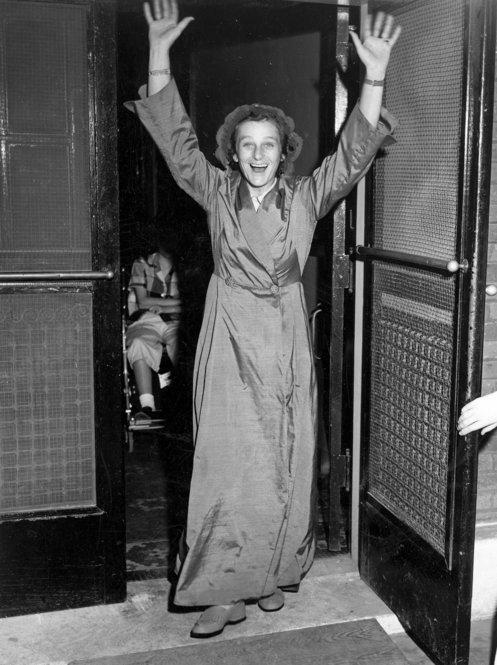 Here, she celebrates as she leaves the Hotel Dieu Hospital in Beaumont, Texas, on May 19, 1953. Zaharias won more than 80 amateur and professional golf tournaments throughout her career and continued to compete after her diagnosis. 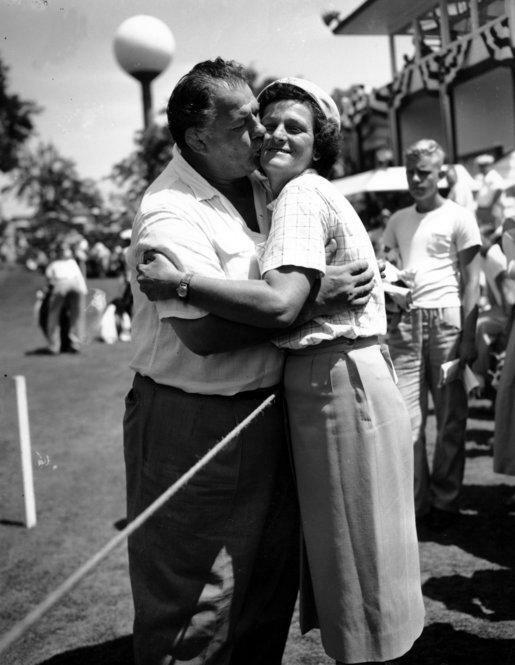 Her husband, George Zaharias, plants a kiss after the All-American tournament in Chicago in July 1953. She died in 1956 at age 45. 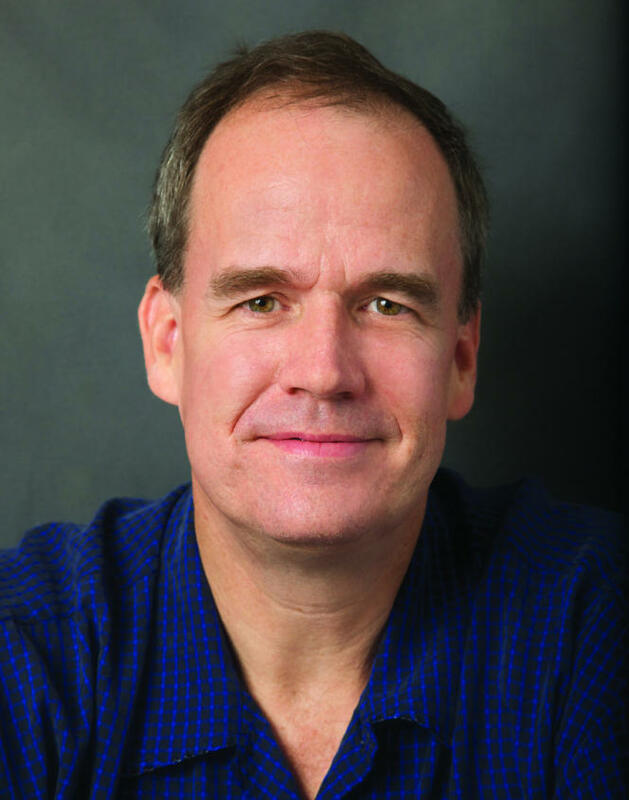 Don Van Natta Jr. is an investigative correspondent for The New York Times, where he was a member of two Pulitzer Prize-winning teams. In 2000, Sports Illustrated named its 100 top athletes of the 20th century. There are names you no doubt are familiar with — Babe Ruth, Muhammad Ali, and of course Michael Jordan. But there's also a name that might slip by: Babe Didrikson. She is the only woman in the top 10. 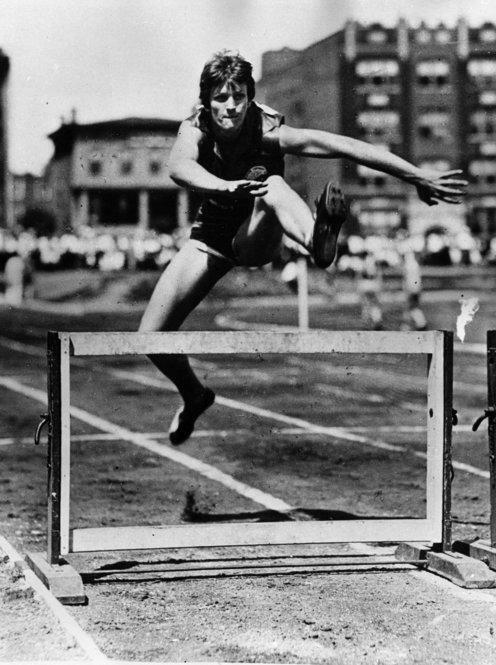 In the 1920s and 30s, Babe Didrikson proved a girl could be a phenomenal all-around athlete. After mastering basketball and track and field, she eventually turned to golf — and won three U.S. Women's Open championships before she died of cancer when she was only 45. This weekend, Babe Didrikson would be 100 years old. 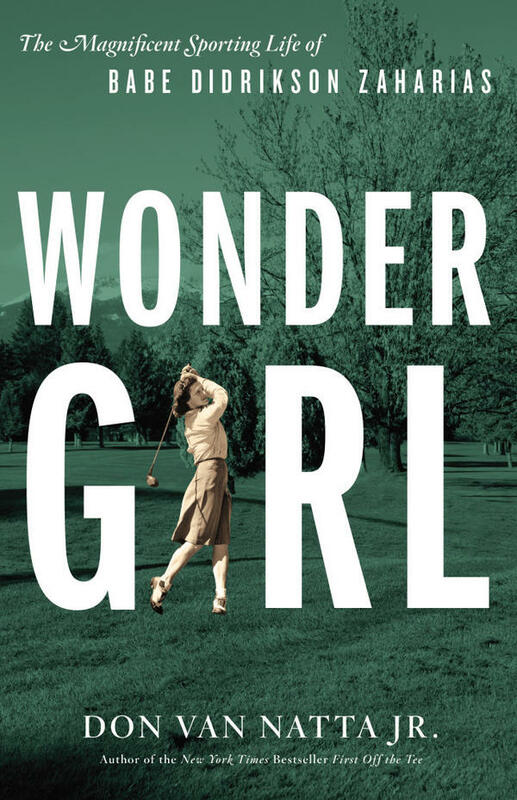 Author Don Van Natta Jr. has written a new book about the life of Babe Didrikson called Wonder Girl: The Magnificent Sporting Life of Babe Didrikson Zaharias. He tells NPR's Rachel Martin that Babe "excelled at every sport she tried to play." Babe Didrikson grew up in a poor family in Beaumont, Texas, where she was often seen running around the neighborhood barefoot, causing mischief when she wasn't playing sports with the local boys and girls. "Around the age of 12 or 13 she became aware of the Olympics and she declared she was going to become the greatest athlete of all time. She didn't say woman athlete, she just said greatest athlete." Even though Babe wasn't concerned with the gender and class issues of the time, she soon learned that women were not supposed to play sports, and she would have to get a job with a business to play professionally for their team. So Babe left high school to work for a company called Employers Casualty Insurance and play for their basketball team, the Golden Cyclones. "Babe went initially and played basketball for the Employers Casualty team, and while at Employers Casualty she took up track and field (...) and within a year and a half Babe was sent by Colonel McCombs, who ran Employers Casualty Insurances' team, to Chicago to compete as a one-woman track team for a spot on the Olympic team." Most companies that had these types of women's athletic teams would send over a dozen girls to national competitions, but McCombs knew that sending Babe alone would draw unprecedented publicity — and he truly believed Babe could win the national championship on her own. "Babe Didrikson won five events [broad jump, baseball throw, shot put, javelin, and 80-meter hurdles] within three hours and single-handedly won the national track championship." In the process, she qualified for three Olympic events: the 80-meter hurdles, high jump and javelin. Babe Didrikson knew she was good, and she wasn't afraid to brag. Van Natta says her self-confidence sometimes upset her teammates. "She would show up and say, you know, who's going to come in second today, Babe is here! And that over-confidence — really, she was a pain in the neck — I think intimidated many of her opponents throughout her career and really worked in her favor." The more championships Babe won the more her confidence grew. But after Babe won two gold medals and one silver medal for track and field in the 1932 Los Angeles Olympics, the press turned on her and began to question her gender. "It was all men writing nasty things about her (...) and it really did get under her skin. It bothered her a lot but she dug in and just kept at it." 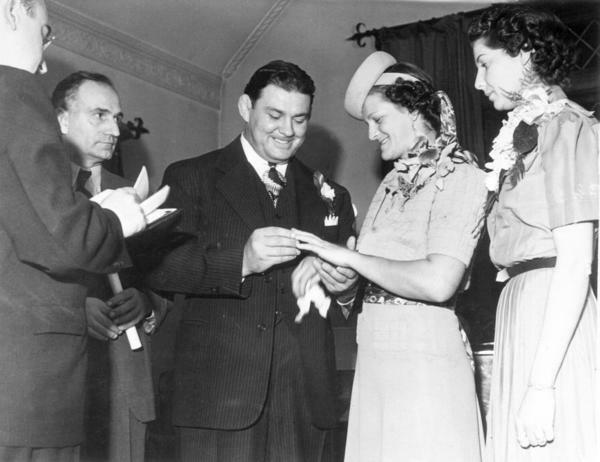 Babe did eventually fall in love and get married to George Zaharias, who was a professional wrestler known popularly as "The Crying Greek from Cripple Creek." It wasn't until Babe was 21 that she started seriously playing golf — the sport she is best remembered for today. Not long after, she was already winning championships and would go on to win three U.S. Opens. Babe liked to tell people she was a natural, but that wasn't entirely true. Van Natta says Babe was a bit of a con artist; "She really knew how to turn on members of the press core with almost a fairy tale story." "For instance, she would go out and shoot an 80 on the golf course [then] would tell the reporters that she shot a 71 or a 72. And she would justify it by saying well they don't want to hear I shot an 80, they want to hear I shot a 71. And the press bought it." In 1948 Babe won her first U.S. Women's Open, the World Championship and the All-American Open. Only five years later she learned she had colon cancer that had spread to her lymph nodes. 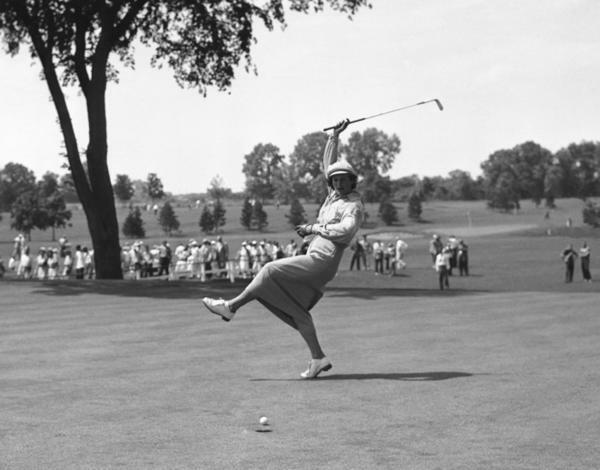 Despite her disease, Babe would make a golf comeback shortly after her diagnosis and would go on to win her third U.S. Women's Open before passing away in on Sept. 27, 1956 in Galveston, Texas. Van Natta says she is no doubt "one of the great American forgotten athletic superstars." RACHEL MARTIN, host: We're back with ALL THINGS CONSIDERED from NPR News. I'm Rachel Martin. In 2000, Sports Illustrated named its 100 top athletes of the 20th century. There are names you have no doubt are familiar with: Babe Ruth, Muhammad Ali, and of course, Michael Jordan. 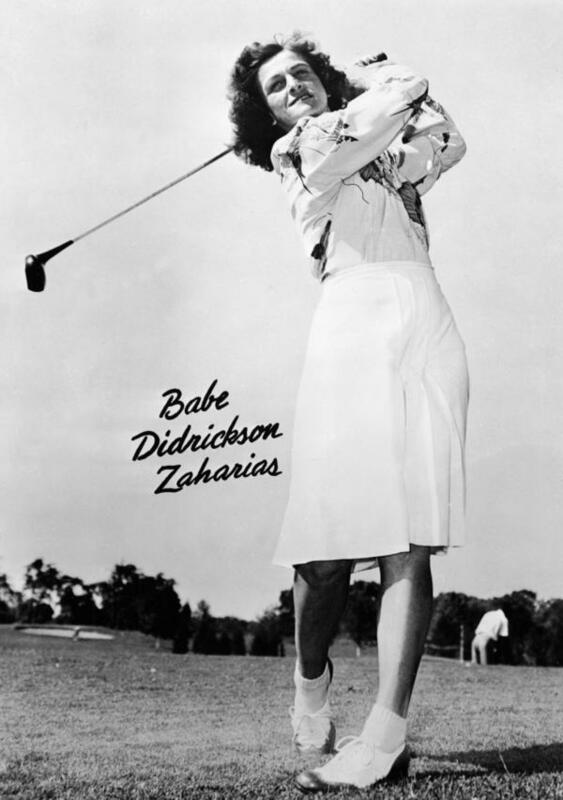 But there's also a name that stands out, Babe Didrikson Zaharias. She's the only woman in the top 10. DON VAN NATTA: Whenever anyone saw Babe, she was running, usually barefoot and always pretty fast for a girl who couldn't have been more of an 8 or 9. And the observant residents of Beaumont South End figured Babe wasn't running to get somewhere on time. They figured she was fleeing the scene of her latest act of mischief. MARTIN: That's Don Van Natta reading from his new book, "Wonder Girl: The Magnificent Sporting Life of Babe Didrikson Zaharias." 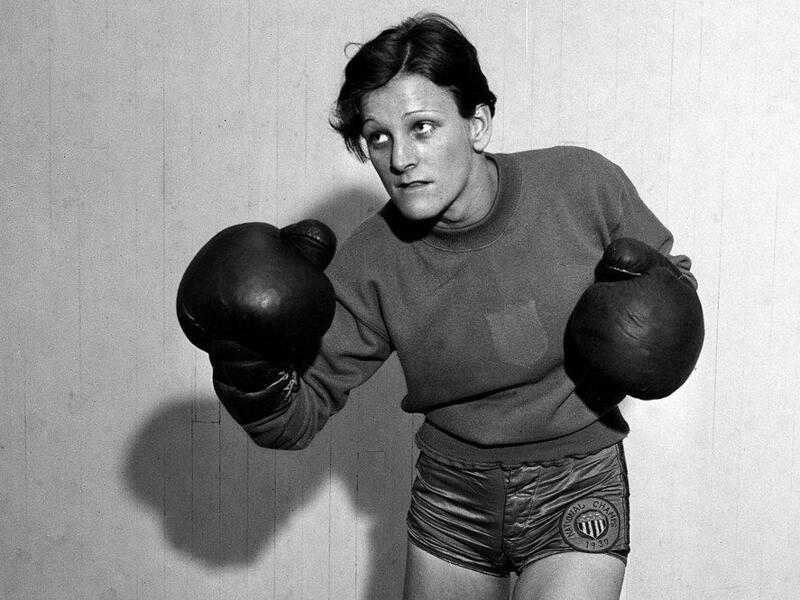 In the 1920s and '30s, Babe Didrikson proved a girl could be a phenomenal all-around athlete. After mastering basketball and track and field, she eventually turned to golf and won three U.S. Women's Open championships before she died of cancer when she was only 45 years old. This weekend, Babe Didrikson would be 100 years old. Don Van Natta is here to talk about her legacy. Don, thanks very much for being here. NATTA: Thank you, Rachel, for having me. MARTIN: So the book makes reference to Babe's sporting life. It really was a life of sports. She didn't just excel in one, right? NATTA: No. She excelled at every sport she tried to play. She was an all-American basketball player who won the AAU Basketball Championship. She then branched out into track and field and won three medals at the 1932 Los Angeles Olympic Games. She excelled at baseball, swimming, softball, tennis, bowling. And finally, after a stint on the vaudeville stage in riding a donkey around the baseball diamond, she took up golf. MARTIN: When did she know that she had this kind of talent? NATTA: It was at a very young age. At around the age of 12 or 13 she became aware of the Olympics, and she declared that she was going to become the greatest athlete of all time. Now, she didn't say woman athlete, she just said greatest athlete. And she never really was concerned with those gender issues or class issues. Those were hurdles that never really occurred to her. MARTIN: But this was in a time - it was in 1920s, and women - you didn't exactly declare that and then go off and join a league and try to become a professional athlete. Tell me a little bit about how women were able to play sports. They played, actually, for businesses that said, you come work for us and then we'll put you on a team, right? NATTA: That's right. She went - Babe left high school and went to Dallas to join Employers Casualty Insurance. And at that time in the late '20s and early '30s, women's basketball was big business, particularly in Texas. And Babe went initially and played basketball for the Employers Casualty team, and while at Employers Casualty, she took up track and field. In fact, one day, she was out on a track and field - in a stadium and she saw what she thought was a spear lying on the ground, and she said: What's that? And she was told it was a javelin, and she started throwing it. And then just within a year and a half, Babe was sent by Colonel McCombs, who ran Employers Casualty Insurance's team, to Chicago to compete as a one-woman track team for a spot on the Olympic team. MARTIN: So let me get this straight. There's the national championships that winners of that would go on to the Olympics. Most companies who had these kinds of women's athletic teams were fielding a whole team, and this man, McCombs, just sent Babe Didrikson? NATTA: Yes, he did. Much to the consternation of Babe's teammates, there were another dozen women that felt they should have been given the opportunity to go to Chicago and compete for a spot on the women's track and field team as well. But Colonel McCombs believed it would be a publicity bonanza for Employers Casualty, and he just felt that Babe could do it on her own, not only qualify for the Olympic team, but win the national championship against teams of 15, 18, 22 women all by herself. MARTIN: And she did it. NATTA: Babe Didrikson won five events within three hours and single-handedly won the national track championship. MARTIN: It's really amazing to think about that. I mean, you do reference, though, that her teammates weren't so happy about this. Babe Didrikson had an unbelievable ego. I mean, she had a lot of confidence in herself. NATTA: She knew at a very early age that she was good, not just better than all the little girls that she was competing against, but against all the little boys she was competing against. And she would get in the heads of her teammates. She would show up and say, you know, who's going to come in second today? Babe is here. And that overconfidence - really, she was a pain in the neck - I think intimidated many of her opponents throughout her career and really worked in her favor. MARTIN: I'm talking with Don Van Natta about his book "Wonder Girl: The Magnificent Sporting Life of Babe Didrikson Zaharias." Her confidence is so remarkable, but there is this issue that comes to the fore about her gender. And all of a sudden, people starts insinuating that she's very masculine, that she might be gay, that she's involved in all these sports because she can't catch a man. Did that get under her skin? NATTA: Oh, absolutely. The press turned on her in a vicious way. It was all men writing nasty things about her. Babe was not a very attractive woman, although, as she put it, she tried to be graceful. And it really did get under her skin. It bothered her a lot. But she dug in and just kept at it. MARTIN: She eventually did fall in love, got married and had a long marriage. She started playing golf seriously, though, not until later in her career. And that ended up being the sport that she's best known for. She would go on to win three U.S. Opens. She told people that she was a natural at golf. Was she a natural? NATTA: No. One of the great things about Babe that I really loved about her personality is her self-promotion. And she really knew how to turn on members of the press corps with almost a fairy tale story. And she had played golf back in high school in Beaumont, Texas on the golf team. MARTIN: There's a little bit in here - there's kind of a con artist in there somewhere. NATTA: Oh, yeah. She definitely was a con artist. For instance, she would go out and, let's say, shoot an 80 on the golf course. She would tell the reporters that she shot a 71 or 72. And she would justify it by saying, well, they don't want to hear I shot an 80. They want to hear I shot 71. And the press bought it. MARTIN: Don Van Natta, Babe Didrikson should have been embraced as an American hero, but for much of her life she was really seen as this kind of an oddball, even a freak. How has our image of her changed over time, do you think? NATTA: She's, I think, one of the great American forgotten athletic superstars. I went to Beaumont when I began research on this book seven years ago, and there was a little museum there for Babe. It's a building that's just devoted only to Babe Didrikson. You can see her two gold medals and her silver medal, a key to Denver that was given to her after she won the Women's Amateur in Scotland. And I went there on a rainy day in November, 2004, and I was the only visitor there that day. And I was really struck by that. This is a great story and a great icon, you know, before there was a Bo Jackson or a Michael Jordan or a Deon Sanders attempting to play two sports and actually not even playing the second one that well. Babe played all sports and excelled at all of them. And if she were alive today her stardom would know no bounds, and she would have the biggest sneaker contract in history. MARTIN: And probably a reality TV show. MARTIN: That's Don Van Natta, correspondent for the New York Times and author of "Wonder Girl: The Magnificent Sporting Life of Babe Didrikson Zaharias." Don Van Natta, thanks very much. NATTA: Thank you, Rachel. Appreciate it. Transcript provided by NPR, Copyright NPR.